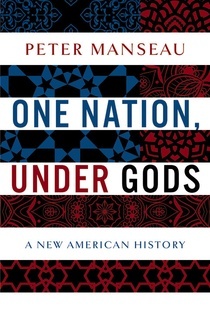 A new book, One Nation, Under Gods by Peter Manseau, is one of the best books I have read in a long time. Mr. Manseau reviews the history of religion in the United States of America from 1492 (with some info on religion in North America before the Europeans came) up to the present day. It is a very easy-to-read book, despite being full to the brim with facts. I think I am fairly well versed in history but this opened my eyes to many more new facts. I never knew that Cotton Mather (yes, *that* Cotton Mather) advocated for an early form of vaccination, a fair number of the Africans brought to the US were Muslims, slave owners wavered between teaching Christianity to their slaves and forbidding it, that Thomas Jefferson wrote a favorable letter to a Seneca (a Native American tribe) religious leader, a Muslim slave might be the origin of the black colored kachina in Zuni folklore, Hindu leaders were giving speeches in the US in the 1800s, etc. This book does a lovely job in dismissing the delusion of some American Christians that the US was only established by their version of Christianity and is only for them and them alone. It does treat religion fairly, showing its benefits and does not hold back at all at showing its warts. Everyone should read this book if they want to know the deliciously complicated religious history of America. It is more than worth the price of admission. I decided to do a riff on a webposter I saw on Mike’s website here. This is an amazing example of layers and cross-bedding, where the direction of the propelling force (in this case both wind and water) changed repeatedly over time, a lot longer than 40 days and 40 nights. This webpage is a very good overview of the stratigraphy of Zion National Park. 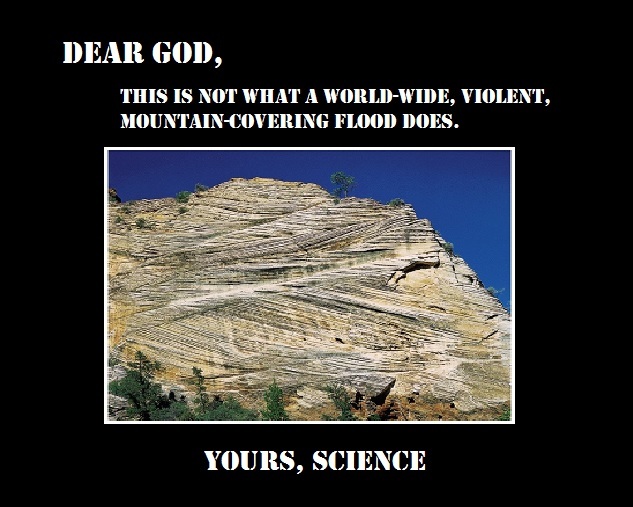 If you’d like more info about the flood nonsense, this is a very nice video from potholer54. You can also use the search function on my blog and find where I’ve discussed the flood. What the Boss Likes – Antibiotics, I love them and the science that discovered them! Humans aren’t impervious. We can get infections from a lot of things. The germ theory allowed us to get into hygiene, and then determined scientists got us arsphenamine, penicillin, and so many more antibiotics. When I watch a historical documentary, especially about a war, I am horrified to think that most of these were before antibiotics. People constantly died of infections we think nothing of because science takes time /and or is determinedly ignored or attacked. Happily, we have them now and I am of a generation that hasn’t had to worry too much about what often killed my ancestors. Right now, I am recovering from a nasty deep abcess in my groin (yes, that may be too much information but there’s no reason to be embarrassed by it). No idea where it came from but oh boy, it was there. It’s been a while since I’ve had such pain (the pain from my gallbladder attack still wins but not by much)Our bodies do what they can to fight invaders, and my body did its best, white cells died by the thousands or millions, but that wasn’t enough. So, I had my abcess drained, thank you Doctor! Thank modern medicine! I am on three antibiotics, Bactrim (which also has a sulfa drug in it), Keflex and Flagyl. These are all very powerful, they can have side effects, but that’s better than courting sepsis. 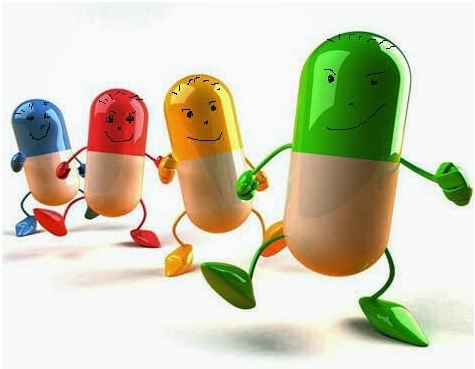 I will of course take all to their last pill (and these aren’t small) because I don’t want any little buggies developing a resistance and either re-infecting me again or infecting someone else, which would be worse. Take all of your antibiotics. Don’t ask for antibiotics for any little thing or for something that is a virus. Get your vaccines if you are medically able. The life you may save may not be your own. Don’t be embarrassed to tell your doctor exactly what is wrong and where. They’ve heard it all before. There is no need to suffer pointlessly. Which reminds me, I love painkillers too! Percocet is a wonderful thing when you need it. Rather than take up space on another’s comments area, I’ve brought a debate over here. I’ll post Seth’s post, and in comments, I’ll put my response. If you would, tell me what was your reason to be a Christian? Could you also tell me what sect you are…? If religious experience isn’t entire conclusive when comparing one religion to another, what would you suggest using? These kinds of questions, I think, is what got me interested in apologetics — I wanted to compare Christianity to other religions in arenas such as history, archaeology, philosophy, etc. For example, I don’t think I could be a Muslim because I think their take on who Jesus was is historically false; I reject Hinduism, in part, because I think their cosmology doesn’t line up with what we know of the origins of the universe; I don’t believe in Mormonism because nothing in their historical sacred text seems backed up by archaeology; etc. I actually was a Hindu (sort of) for awhile, when I left the church for awhile and was experimenting with other spiritualities, and there were experiential differences as well that helped further convince me that there was something special about Christianity. How can someone say that someone else is mistaken to the cause of an experience? 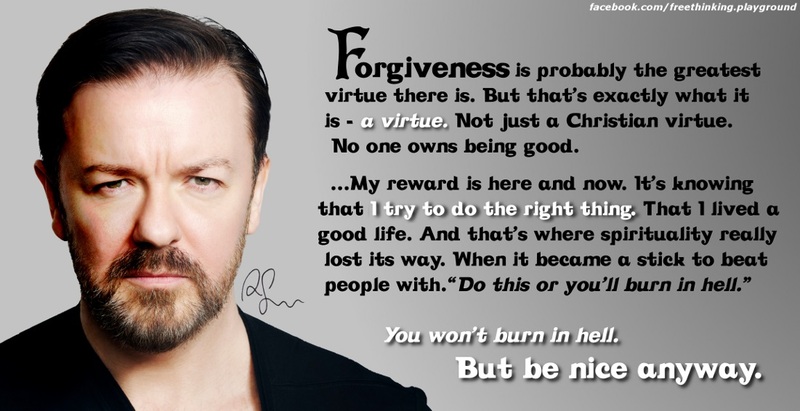 This occurs even within my own religion. For instance, though our church doesn’t make a big deal out of the spiritual gift of tongues, we believe it can be a legitimate expression of God’s love. I’ve heard people admit that they would do things like speak in tongues in order to be a part of what other people are experiencing. They didn’t necessarily recognize at the time that they were doing these things on their own (psychology is tricky that way), but later on, after experiencing what it’s supposed to feel like, they were able to admit that the experience they were having wasn’t something from God, but it was something from their own desire to “fit in”. I see that you believe that your god can touch people of other religions. How does it does this and why doesn’t it tell these people that Chrisitianity is the only right one, an idea which I would assume you believe if you believe that one can only be saved through Jesus Christ. 1) I believe He does do this, exactly. It seems that people in the Muslim world, for example, are coming to Christianity in pretty significant numbers because of visions or dreams of Jesus telling them where they can find missionaries who will tell them more about Him. 2) Believing that one can only be saved through Christ is not the same as saying one can only be saved through belief in Christ. I think there is Biblical support for the idea that God is more interested in our level of response to the revelation of Him that we have received than He is about what we say we believe on a creedal level. C. S. Lewis gave a nod to this idea in one of the Narnia books, where one of the “bad guys” ends up in Aslan’s Kingdom, much to his surprise and others’, since he technically served another deity — yes Aslan, seeing the sincerity of his heart and knowing that he had no opportunity to learn directly about Him, counted his worship for the other god as if he had done so for Aslan. John 10:16 comes to mind, but there are other passages as well. You also claim that this god loves people, which would not be supported in the bible, from this god’s actions against those people who do not believe in it. This statement seems to assume that sending unbelievers to hell is unloving. What makes you say this? If hell is just punishment, then it has nothing to do with love, it has to do with justice — it’s not “unloving” of society to send criminals to prison. Also, I think, in a way, hell in itself is a manifestation of God’s love for unbelievers, for He is honoring their decision not to be separate from Him. To force them to come into heaven and be with Him for eternity would be an even greater hell for such people, I think. It is interesting that you believe in other supernatural entities. Do you believe that they are all “evil” since they are not of your god? I believe the Biblical revelation about the existence of angels and demons, so they’re not all evil — just the ones that are trying to lead people astray and give “false” experiences and visions. Can you do any of these things? I am not the personal eyewitness to the sort of “mind-blowing” miracles spoken about in the New Testament, but I have seen quite a few “smaller” occurrences (some of which I had a hand in) that I would consider miraculous to convince me that such things do happen. I also know people who claim to be eyewitnesses to such things, and there’s also resources such as Keener’s book on miraculous healings that provide documented support that such things still occur. Can you show any evidence for the essential events in the bible? I probably don’t have much new for you in this arena — I have an interest in history, but I am no historian. I am a fan of Gary Habermas’ minimal facts argument for the resurrection of Christ, however — since, really, the only miracle that really makes-or-breaks my faith is the belief that Christ rose from the dead. If someone claims that their god talked to them, or did a miracle, why would you not accept that it was the god they claimed, and not some other interpretation that you might put on it? Because I have to reconcile such data that comes in with other evidences. For instance, I don’t believe in ghosts — and yet I believe that some poltergeist activity is legitimate. When someone claims to have had contact with a dead relative or something, I process that claim in light of other such experiences that, if allowed to continue, led to more demonic activity, where the “spirit guide” or whatever they thought it was would show its “true colors” at a certain point. I believe along the same lines when it comes to things like UFO sightings and alien abductions — I believe they can be legitimate experiences, but I don’t believe aliens are actually making contact with us, for the data seems to better indicate a demonic trick. What would make someone’s philosophy “well-rounded” and “mature” to you as opposed to something that wasn’t either of those things to you? It’s sort of a vague question, but I think I get the gist — forgive/correct me if I’m wrong. I guess the reason why I use such language is because it seems to me that most errors in forming one’s worldview come from a myopic processing of data — i.e., giving one piece of truth more weight or significance than others. It’s the root of biases, in my opinion. I’ve often said that when it comes to most people I speak with on any subject, we can generally agree on most of the facts — we just weight their significance differently. It’s like ethics, I guess — less a discussion of “what is morality?” and more about a discussion about conflicting definitions of “the good”. I feel I am in danger of rambling, and I doubt I am answering the question well 😛 I guess it comes down to weighing all the evidence, not just the evidences that sound good, or that line up with our upbringing — going out there and seeking out the whole truth, and rather than ignoring data that doesn’t fit with our worldview, finding a way to incorporate such data into it. I hope that makes sense. Below, I’ll put my reply and we’ll keep discussing. Comments are welcome from observers. As always, support your claims with evidence. Whee, it’s snowing again here in PA. 😛 I wanted to try to make a soup, so I got out my copy of Wright’s The Best Soups in the World, and tried to find something I had most of the ingredients for. 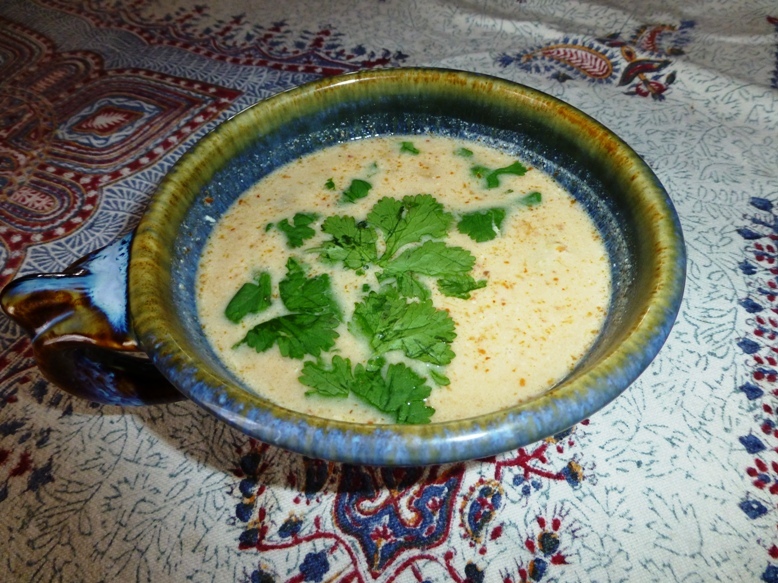 As luck would have it, I had most of the ingredients for tom kha gai, Thai coconut chicken curry soup. You can guess how odd my pantry is in that I had everything except lemongrass. My recipe is a riff on the one I found in the cook book. To us, it tastes very much like what we get at our local Thai restaurants. Mix coconut milk, ginger, lemongrass and lime zest. Bring to boil. This stuff will boil over quickly, so keep an eye on it. Reduce to medium, and add chicken, fish sauce and sugar. Cook until chicken cooked through. Add lime juice, and curry paste and stir to combine. Serve. If you like cilantro, I find it a very nice addition. The recipe in the book had adding crushed fresh thai or Serrano chilies. For me, the red curry paste is hot enough to make my nose run plenty. Of course, any of these ingredients can be varied in amount to suit your tastes. I think it would be good with shrimp, firm tofu, pork, etc. We also made a classic roast beef dinner. Lots of leftovers for the week!